This entry was posted in Uncategorized on April 30, 2004 by John. I’m wondering if now that she’s 22 it’s alright for me to admit I have a “thing” for Lacey Chabert. It probably is directly related to her two-year stint in the role of Cosette on Broadway. 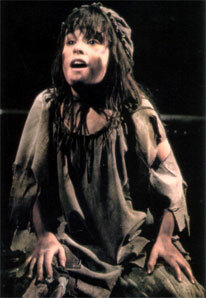 (And likely played Gavroche once or twice since most actresses who played Young Cosette were also an understudy for the Gavroche role…) I’m not saying I thought she was anything but cute in Party of Five. I’m not saying I thought she did the best acting job of all the cast in Lost in Space, though she certainly did better than Matt LeBlanc. Let’s just say she is aging nicely. Ohio judge sentenced teen who stole adult vidoes to stand outside the adult video store, for 4 hours, blindfolded. Now, if the crime was being perverted enough to be interested in adult videos (whether this is perversion or not for a teenager is arguable – some would probably think it perfectly healthy), one might argue this could deter future perversion. It is in a sense putting the kid on the other end of the fishbowl. Depending upon how perverse he is, he might enjoy it. I have no issue with unusual alternative sentencing. However, this has nothing whatsoever to do with teaching the kid what’s wrong with shoplifting. Which, I assume, is the crime he committed. This punishment by the same judge, seems more appropriate. But it’s possible he might view humiliation as an appropriate teaching tool. This entry was posted in Uncategorized on April 27, 2004 by John. I think I would be willing (and likely to try) giving a dog or a cat “the kiss of life” as apparently UKers call it. But I think I would draw a line at a goldfish. I’ve decided I spend way too much of my free time writing and not enough reading. Every good writer must also read — its illogical to consider an artist who doesn’t appreciate other artists. The first book to read will be Treasure Island by Robert Louis Stevenson. Personally, if I were to choose an RLS novel to read it would have been Dr. Jekyll and Mr. Hyde. Or his collection of essays, Familiar Studies of Men and Books (but only because of the essay on Victor Hugo). So it only seems appropriate the first book I read in this book club is by him, and I wasn’t even around when they picked it. I read Treasure Island, I believe, when I was a kid. (Or perhaps an abridged version.) And I’ve been to Treasure Island (or the island in the Caribbean RLS allegedly based the novel on.) So I’m looking forward to this. Maybe, once I’m done with the novel I’m working on, and succeed in getting it published, I’ll convince them to discuss it…the only problem with that is how I will react when everyone in the group says its the worst novel they’ve ever read. This entry was posted in Uncategorized on April 26, 2004 by John. There is no longer an anti-semitic hate site at the #1 ranking when you use Google to search for ‘Jew’. The site that used to be there isn’t on the first page of results, or the second page. A mirror site appears on the third page. What happened? Did Google do what it said it wouldn’t do? Maybe not. They (or dmoz.org) did remove it from a category of hate sites. The directory is accessible at directory.google.com or dmoz.org. This undoubtedly affected their ranking negatively. Though, while all the sites in this directory are chosen by people (anyone can volunteer to manage a category), I do question the decision of whoever made the choice. The hate site, unfortunately, does belong there. The owner of the hate site, who is a St. Louisan, and who’s address and phone number used to be accessible with a simple WHOIS query at networksolutions.com has purchased a private registry. A brief search of NetworkSolutions site, and no mention of a TOS requirement for having a private registry. Godaddy.com (which has much cheaper annual fees for domain names), refuses to provide private registration to “morally questionable” websites. NetworkSolutions may not make that decision. Which is laudable from a freedom of speech perspective. Frank Weltner’s couchpower.com domain is still not private, by the way. My spam mail has increased 10 fold since I joined JewSchool in blogging about this. I’m sure that’s coincidental. Correction: The link in Google/Dmoz.org’s directory hasn’t been removed. It is still here. However, when you list every site that links to the hate-site above, Google only lists one of their directory categories at the top of the list. The second category, where I thought it had been delisted, is actually on the 2nd page. I believe (but I’m not sure) this means the value of that link in a site’s ranking has become devalued. Whether this is a result of something Google did intentionally, or other factors, is unknown. Newman has asked the administration to put an end to this event, or at least to get students to change the name. This entry was posted in Uncategorized on April 23, 2004 by John. This entry was posted in Uncategorized on April 22, 2004 by John. Restaurant Fined over plans to serve food on half-naked women. The practise of eating sushi off naked or nearly-naked women has long been popular with a certain clientele in Japan. But the authorities in China said the restaurant’s actions violated women’s rights, as well as laws on advertising and food sanitation. Some “were indignant, claiming it is humiliating to women,” the official China Daily newspaper reported at the time. “But others were curious and tempted to have a try,” it added. Talk about serendipity, creative bloggers at StlBloggers.com recently wrote a round-robin fic that mentioned both sushi and a naked woman. I wonder if a sushi restaurant in St. Louis would be willing to give this a try? (Or maybe someone could open up a sushi restaurant ‘across the river’) Any entrepreneurs out there? St. Louis wouldn’t be the first American city to offer this delicacy or the second. And back in 1960 a picture of this delicacy appeared on the cover of Vogue. This entry was posted in Uncategorized on April 21, 2004 by John.